JP 7538 appears to be another wonderful combination of Bedford SB chassis and Duple coach body, except that it isn’t! The Crossley SD42/7 chassis dates from 1949, when it was new to Liptrot of Bamfurlong, near Wigan. 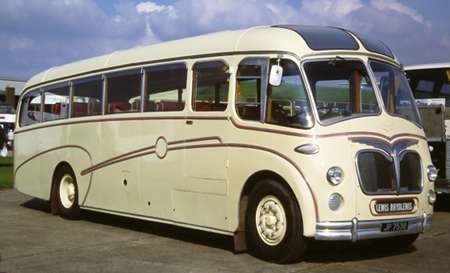 A new Duple C35F body, as seen here, was fitted in 1955. We see it at Duxford on 28 September 2008. One of Gerald and Simon Emerton’s fine collection at Nantwich, Cheshire. Registration number should read JP 7538. One of two (the other being JP 7537) new to Liptrot with Bellhouse Hartwell C33F bodies. Both rebodied by Duple as seen here whilst still with Liptrot. This one passed from Liptrot to Towler, Emneth 10/63, then to Lewis 7/65. Withdrawn 8/72 but still owned (unused) by Lewis in 4/81, subsequently to Emerton for preservation. 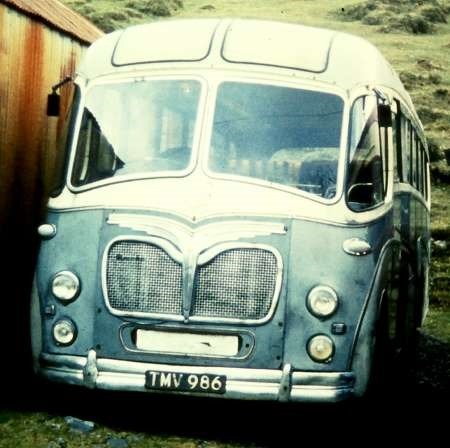 The frontal aspect of this Duple body differs from the Bedford version in the slightly shallower windscreens with greater downward curvature to match the level of the side window line, and winged motif set above the smaller, lower front grille, rather than incorporated as part of the top frame. This coach would have been delivered with the HOE7/4 version of the dubious 8.6 litre engine, the last wholly Crossley effort in remedying the shortcomings of this motor before AEC, exhausted of patience with the Errwood Park concern, came up with the HOE7/5 downdraught replacement. What engine does it now have, I wonder? According to Eyre, Heaps and Townsin, despite the poor reputation of the Crossley engine, Birmingham Corporation, who had substantial fleets of both types, rated the DD42 rather more highly than the Daimler CVD6 on performance and reliability grounds. The grille on the Crossley is actually the standard ‘early butterfly’ type with winged motif above a smaller grille with fine mesh, as used on the 1955 season Super Vega (body series 1055). The previous 1954 season model (series 1050) was the same body but with the oval ‘fishmouth’ grille, then the 1956/7/8 season models (series 1060/1074/1090) were the classic 30ft. version with continuous (unstepped) waistline, three piece rear windows and the larger, flashier grille incorporating the motif and with a more open mesh. We have 1956 and 1957 Duple Annuals in the Glasgow Vintage Vehicle Trust archive and it does not seem to have a model name like Vega or Corinthian. It is just described as "the rebodying product from Duple"
The Vega model name and its derivatives (Super Vega, Bella Vega, Vega Major, and all others beginning with ‘V’ – Vista, Super Vista, Bella Vista, and Bella Venture) were used exclusively for Bedford chassis by agreement with Vauxhall Motors (which maybe not coincidentally began with ‘V’). Super Vega-based designs for mounting on other makes of chassis – new Ford Thames and Commer Avengers, and rebodies on AEC Regal, Tiger PS, Daimler CVD6 and Maudslay Marathons though extremely similar were unnamed until the model names Yeoman (for Fords) and Corinthian (for Commers) were belatedly introduced for the three-piece screen version for the 1961/62 seasons. Similarly during the early 1960’s bodies for Fords had to be given different names to the equivalent Bedfords. Bella Vegas became Troopers; Vega Majors became Marauders, then Mariners; Bella Ventures became Empresses. It was only with the introduction of the Viceroy at the 1966 Commercial Motor Show that the same name became applied to both Bedfords and Fords, then later to heavyweights as well. I’ve personally heard Birmingham’s preference for Crossleys over CVD6s confirmed by someone who used to work there. However, I don’t think that either engine was anywhere near as "dubious" when powering a single-deck vehicle. A former contributor to this forum has described both double-deckers as "distress purchases" in times of vehicle shortage, but both CVD6 and SD42 had a positive following when it came to coach work. According to "Happy Family", the story of Yellow Bus Services from Guildford, they had 2 Dennis Falcon P5s (VPA 261-2) with Duple Vega bodies. An operator in Guildford, buying Dennis chassis? I wonder why that doesn’t surprise me! I brought up the Falcolns because of John S’s posting about V type bodies being Bedfords, I wondered if John’s comment meant that technically the book might be wroong to use the Vega name. Re your comment: YBS over their 36yr life 1921 to 1957 appear to have had 66 vehicles: 33 Dennises, 24 Bedfords, 4 Fords, 2 Chevrolets, 2 Morrises and a Leyland. So they were quite loyal to Dennis but obviously favoured Bedfords as well. 17 of their Dennises and all the other makes predated their first Bedford in 1937 and the last of those earlier ones was gone in 1939. Mercifully (to my mind) neither of these coaches has the butterfly front grille. These pictures were taken in Guildford’s Onslow Street bus station, and the building in the background is the former Dennis works built in 1901. The site was retained as a repair shop when Dennis production finally moved to the new factory at Woodbridge Hill, which opened in 1905 and expanded thereafter. The Onslow Street premises were sold to the Rodboro Boot and Shoe Company in 1917, and they still stand. When you look at the photos Roger has given links to, it’s in the mindset that they have Bedford chassis, such is the relationship between these bodies and Bedfords! It’s a surprise to me that we now know of at least Dennis and Crossley chassis being secreted underneath! The Vega-style bodies went on the following lightweights besides the SB, Albion Victor FT39, Commer Avenger, Dennis Falcon, Ford Thames Trader PSV, Leyland Comet ECPO1/2T and Tilling Stevens L4MA8. The rebodying product to my knowledge on AEC Regal III, Crossley SD42, Daimler CVD6, Maudslay Marathon III and Leyland Tiger PS1. Isn’t TMV 986 with Silver Star rather than Express? As I bought the copy slide, it was in the vendor’s listing as with Express. You may be correct and the vendor may have been wrong. I have no idea!